I bought this ornament as a gift for my son's kindergarten teacher who loves hummingbirds. I was so impressed when I opened the package. The pictures do not even do it justice! It is beautifully made and I know she will love it! And I love giving a gift like this that gives both ways!! 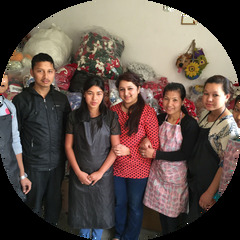 Thank you so much LeeAnne for your continued support of the fair trade movement and for living your ideals and allowing your hard earned money make the most impact towards helping others in developing nations. You have an unwavering spiritual calling to help others. May God Bless You. Thank you LeeAnne!!! Beautifully colored Great Horned Owl- Super attention to detail and very nicely made.